My ultimate dream is to sow seeds in the desert. To revegetate the deserts is to sow seed in people's hearts. 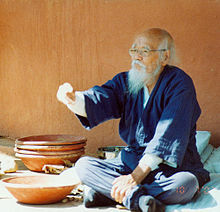 Masanobu Fukuoka (福岡 正信, 2 February 1913 – 16 August 2008) was a Japanese farmer and philosopher celebrated for his natural farming and re-vegetation of desertified lands. He was a proponent of no-till, no-herbicide grain cultivation farming methods traditional to many indigenous cultures, from which he created a particular method of farming, commonly referred to as "Natural Farming" or "Do-Nothing Farming". The Road Back to Nature (1984; English translation 1987, p. 360). The One-Straw Revolution: An Introduction to Natural Farming, translated by Larry Korn, Chris Pearce and Tsune Kurosawa, New York Review Books, 2010. Originally translated in 1978. Eventually I decided to give my thoughts a form, to put them into practice, and so to determine whether my understanding was right or wrong. Speaking biologically, fruit in a slightly shriveled state is holding its respiration and energy consumption down to the lowest possible level. It is like a person in meditation: his metabolism, respiration, and calorie consumption reach an extremely low level. Even if he fasts, the energy within the body will be conserved. In the same way, when mandarin oranges grow wrinkled, when fruit shrivels, when vegetables wilt, they are in the state that will preserve their food value for the longest possible time. If 22 bushels (1,300 pounds) of rice and 22 bushels of winter grain are harvested from a quarter acre field such as one of these, then the field will support five to ten people each investing an average of less than one hour of labor per day. But if the field were turned over to pasturage, or if the grain were fed to cattle, only one person could be supported per quarter acre. Meat becomes a luxury food when its production requires land which could provide food directly for human consumption. This has been shown clearly and definitely. Each person should ponder seriously how much hardship he is causing by indulging in food so expensively produced. This page was last edited on 4 March 2019, at 20:28.